Finally my wish to prepare Paddu has come true! 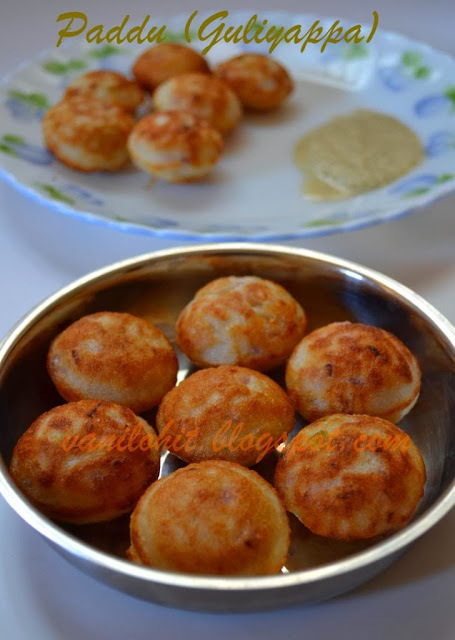 I didn't have a Paddu pan till recently and was telling hubby to buy the same for me. 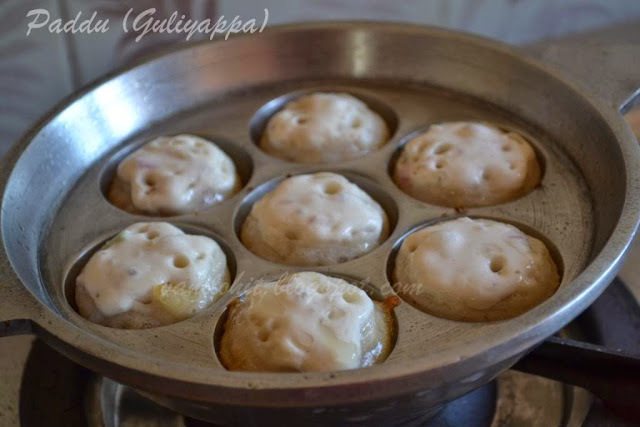 Last month, we had been to buy some vessels and hubby got a Paddu pan :) After that, I prepared Paddu so many times and every time, it was a success! 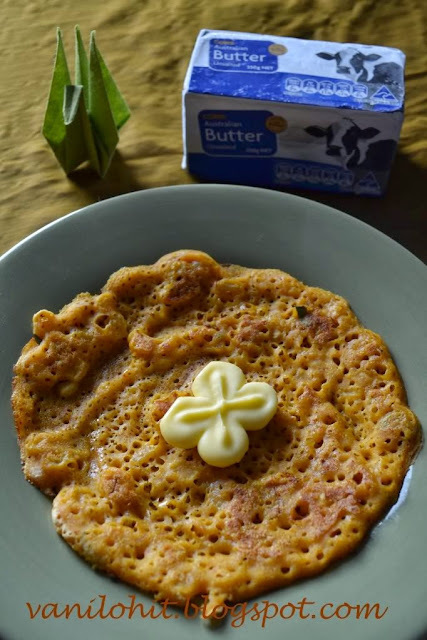 If you have left - over set dosa batter, its damn easy to prepare Paddu. 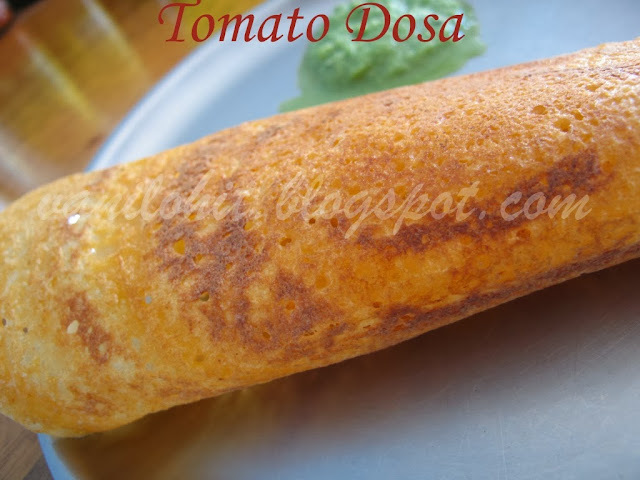 I have used the regular set dosa batter for preparing Paddu and add few more ingredients like onion, green chillies, etc. for this batter. Paddu goes well for breakfast, lunch box, as well as evening snacks. 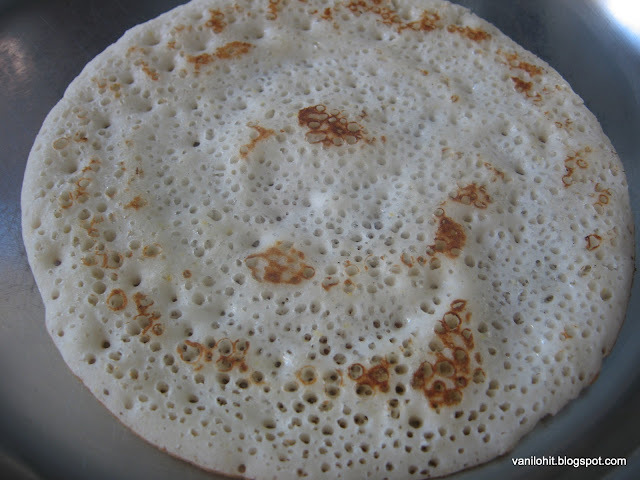 Prepare the batter in the same way as set dosa and keep it in a warm place for 7 - 8 hours for fermentation. Add 1 spoon of sugar and salt to taste and mix well. Then add finely chopped onion, green chillies and curry leaves and mix it nicely. Heat the Paddu pan and fill each hole with 1 tsp of oil. Fill the batter in every hole up-to 3/4th level using a table spoon. Leave a little space for the Paddu to puff up. Once the base of the Paddu turns golden brown, turn it carefully and cook the other side also. 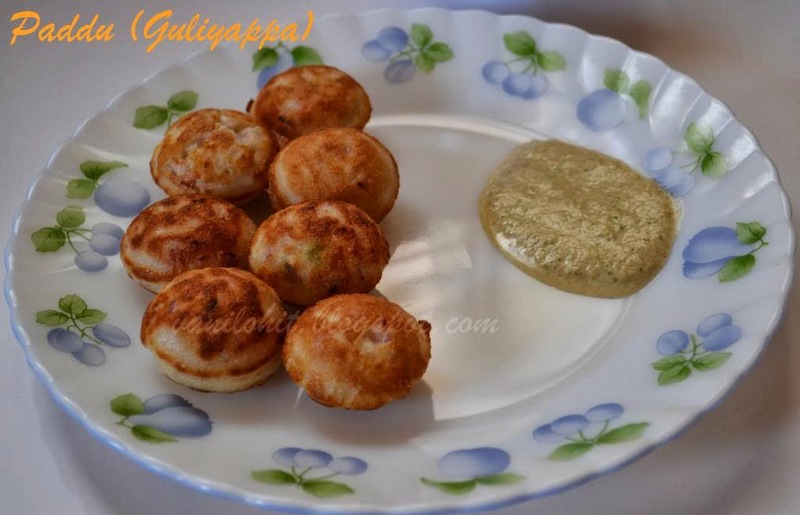 Serve hot Paddu along with Coconut chutney. 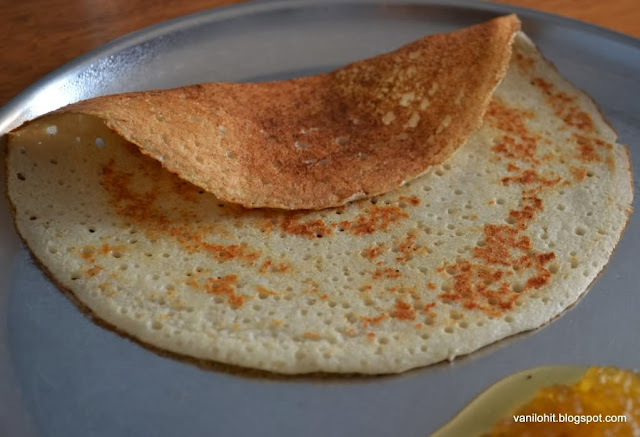 Left over dosa batter can be refrigerated and used to prepare Paddu for the same evening or next day morning. I was eager to post this recipe from long time, but couldn't prepare it since I had a stock of some other chutney powders. 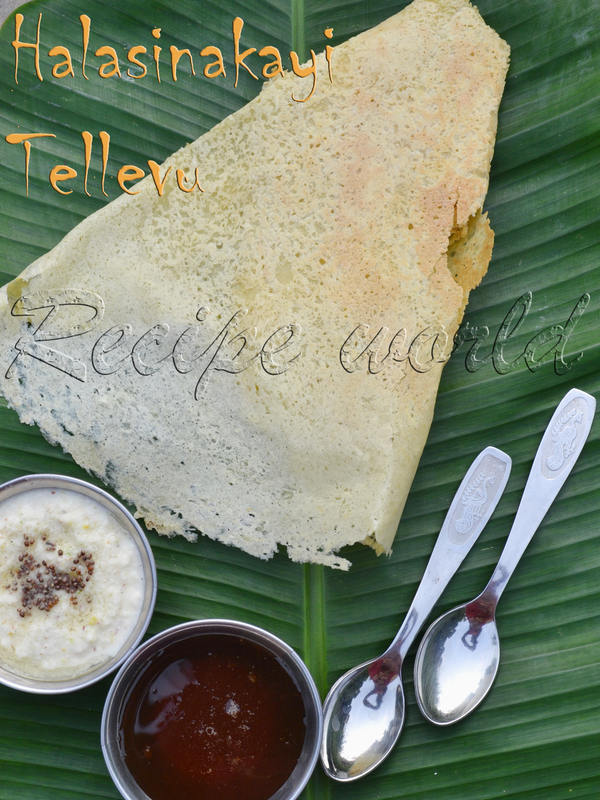 This recipe is from a Kannada recipe book which I referred sometime back. As we all know, using curry leaves in our daily food is very good for health. Especially for diabetic patients, it is very good to use curry leaves in their daily diet. In most of the Indian curries, we use curry leaves for seasoning. 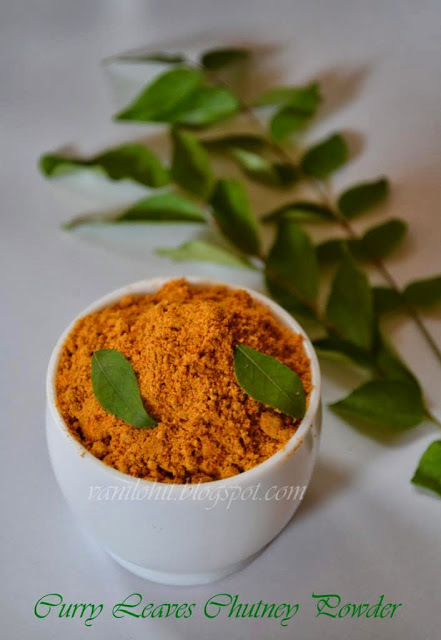 Some people prefer to use curry leaves powder in cooking to make sure that all the people will eat them :) Other than regular cooking, we can prepare different varieties of powders using curry leaves, which goes well with rice or chapathi. 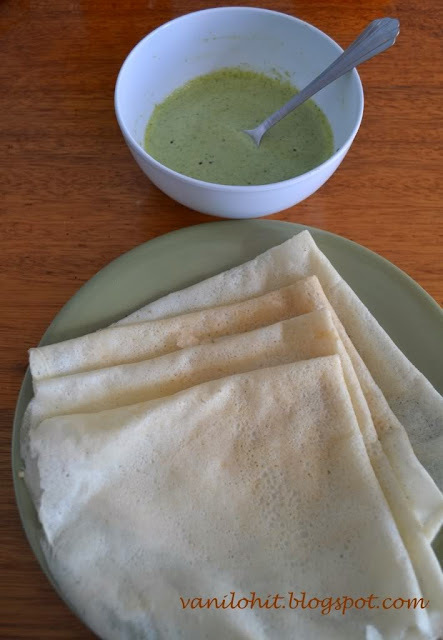 Here is the recipe of Chutney Powder using curry leaves which is a healthy combination with dosa, roti or chapathi. Dry roast all the ingredients first. Roast the dried curry leaves in a heavy bottom pan for 4 - 5 minutes. Roast chana dal and urad dal separately till golden brown. Roast the dry red chillies nicely. Once they are almost done, add desiccated coconut and saute for 2 minutes. Combine all the roasted ingredients; add salt, sugar and amchur powder. Transfer them to mixie jar and make a fine powder. Heat oil in a wok and add mustard seeds and asafoetida. Once mustard seeds start spluttering, switch off the flame and pour this seasoning on the chutney powder and mix well. 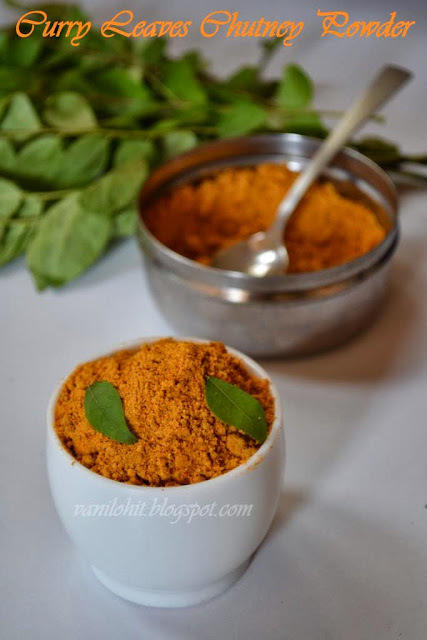 Healthy and delicious chutney powder is ready now. 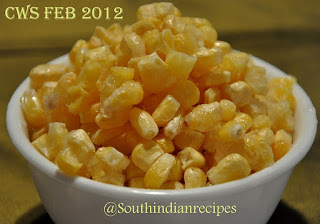 Taste it with dosa or chapathi! To preserve this chutney powder for longer time, refrigerate it in an airtight bottle. Note: Don't dry the curry leaves under direct sunlight; its enough if you keep them in a warm place. Else, you can use oven for drying them. This time, we were happy with the color of the watermelon, but it was not so sweet in taste. 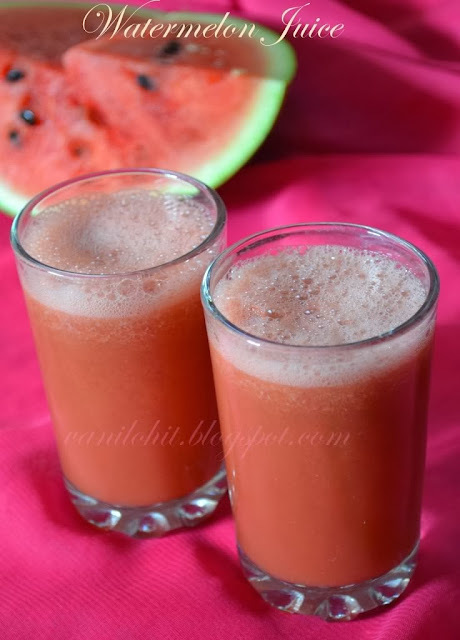 So, I thought of preparing watermelon juice. Believe me, the whole fruit we finished by preparing juice daily :) I had used enough sugar to give a sweet touch to the juice and it was really delicious! 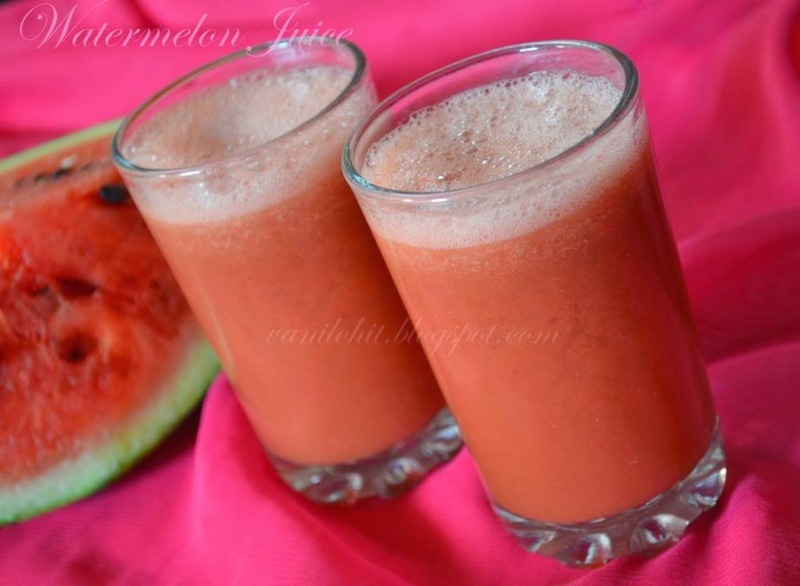 Blend the watermelon pieces in mixer finely. Remove the crushed seeds using a strainer. Add sugar, pepper powder and pinch of salt to the juice and mix well. Serve chilled or add few ice cubes and serve immediately! During hot days, this juice will be a perfect drink to serve. Normally, our week-end lunch consists of some or the other special items every time. During week days, hubby carries his lunch box daily and he will be there only for the dinner. That too, he prefers chapathi and some subzi. Anyways, its good to have light food in the night time. So, anything I need to try new means it will be on the week-ends most of the times! 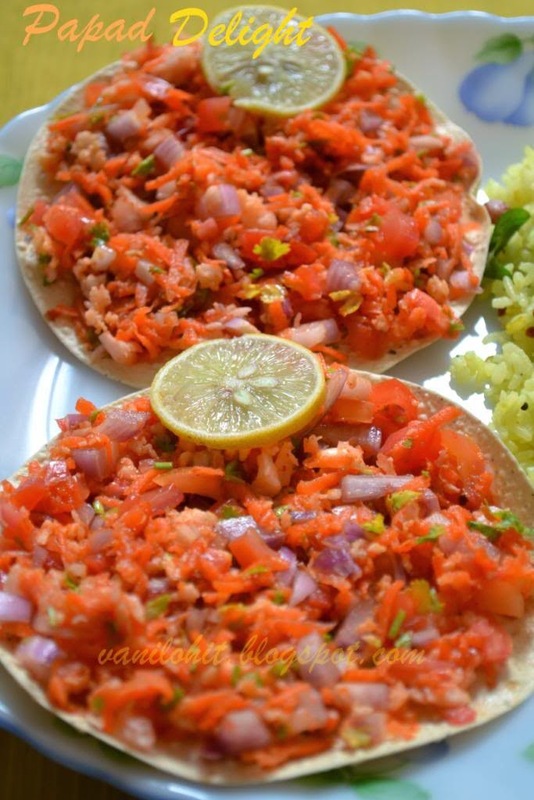 In hotels, if we order the starter item as Papad, they will serve crispy papad with onion, carrot, etc, veggies spread. 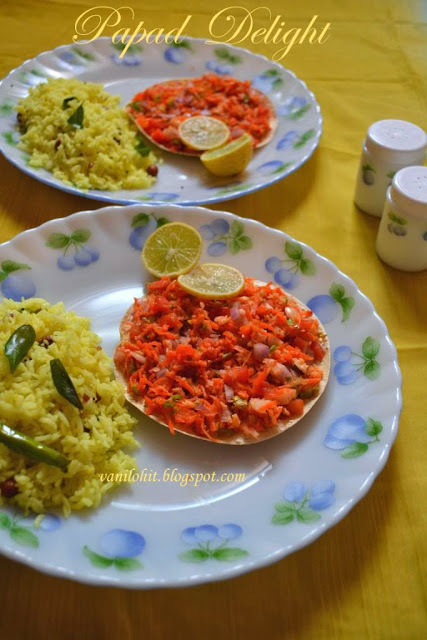 Always we love to eat that papads there and in home also, I will decorate the papad in the same way as they do in hotels. 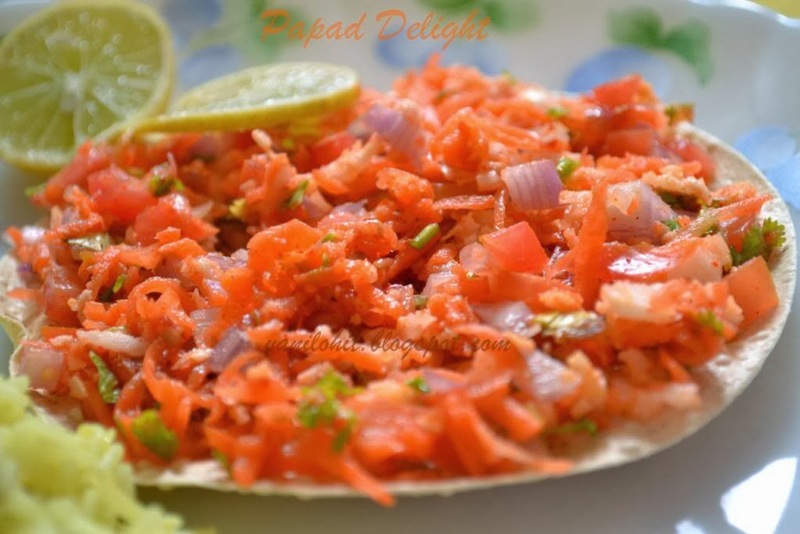 Hubby also loves to have this starter for the week-end lunch :) People who won't like to eat raw vegetables also can try this healthy and delicious Papad Delight! Due to health consciousness, I normally go for roasting the papad instead of deep frying. If you are using the oven, its damn easy to roast the papad! Just keep them in microwave mode under high temp, and your papads will be ready in just 30 - 40 seconds! Chop the onion and tomato finely. Grate the carrot and keep ready. Roast the papads or if you wish, you can deep fry them. Just before serving, combine chopped onion, tomato, grated carrot and coconut and chopped coriander leaves in a mixing bowl. Add salt and red chilli powder for taste and mix well. 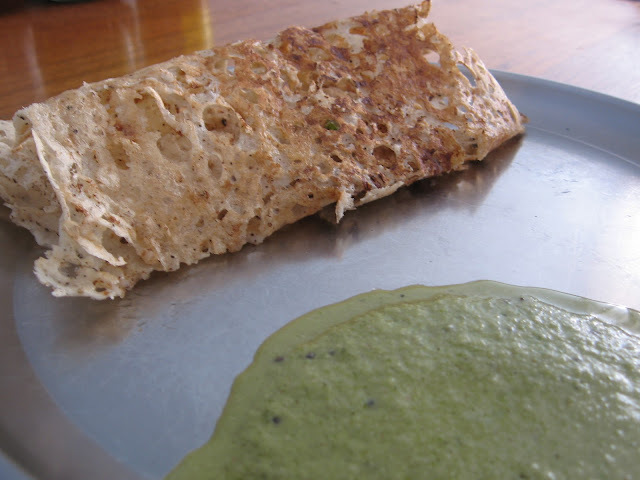 If the papad is spicy, reduce the quantity of chilli powder in the veggie mixture. Spread the veggie mixture evenly on all the 3 papads. Add few drops of lime squeeze for taste and serve immediately. Sprinkle some pepper powder for taste if you wish. You can try adding different veggies, or different masalas like chat masala to make it more delightful. Eat the papads immediately after spreading the veggies. Papad will become smooth and lose the taste if kept for long time. Normally, if we go to any restaurant, first thing we look out for is a good starter. 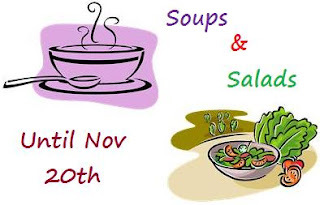 People like me, who are soup lovers will definitely go for a soup! 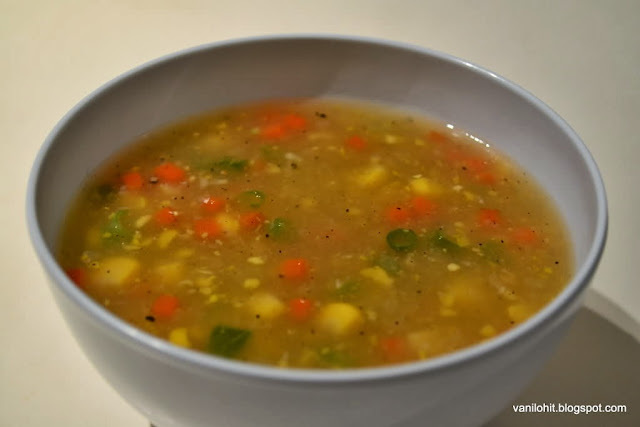 Due to my liking towards the soup, I learned this sweet corn veg. soup recipe with my experiments. It is a healthy starter and gives a kind of warmth during winter and rainy days. Take some water in a vessel and keep it on medium flame. Add chopped vegetables, salt, sugar and sweet corn. Cook them for 10 - 12 minutes. - If you are using the corn cobs, you can cut the cob into 2 - 3 pieces and allow them to cook along with the vegetables. Later, you can remove the kernels and grind half of them into coarse paste. 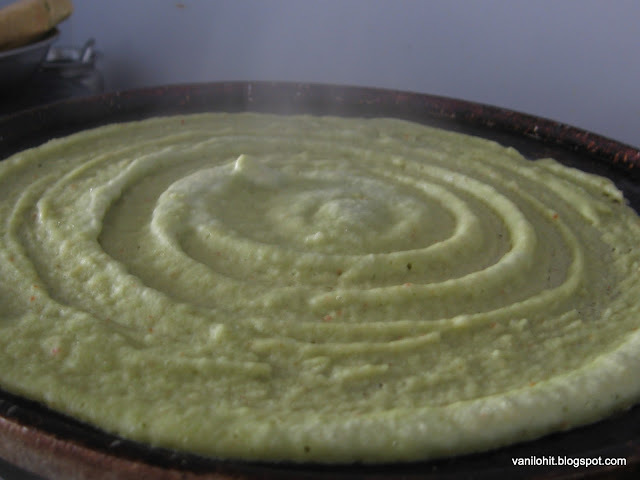 - Else, if you are using the corn kernels, add only half the quantity to the chopped veggies and coarsely grind the remaining. Add the ground sweet corn to the cooked veggies and mix them. In a bowl, mix the cornflour along with some cold water mix it well. Add this to the cooked mixture and stir it. Else, it may stick to the bottom. Add salt, tomato sauce and adjust the taste. If you want, you can add milk and little sugar. Remove it from the flame and add the pepper powder as per your taste and serve them hot. You can add some deep fried bread pieces for garnishing. Sending this over to Soups and Salads Mela hosted by Srivalli. Sending this to Healthy Diet Event - Warm Soups hosted by Priya.